Crimson Rubeus (known simply as Rubeus in the English dub) is the first member of the Black Moon Clan to appear in the 20th century. He is charged with finding a person codenamed "Rabbit", who had fled into the Tokyo of the past. Besides following the orders of Prince Demand and Wiseman, he leads his own set of minions (the Ayakashi Sisters). In the anime, he is the love interest mainly to Cooan, the youngest of them, though the majority of the sisters are in love with him; only the eldest, Petz, doesn't have feelings for him. After the Sisters have been healed, while trying to take Chibiusa, Rubeus kidnaps the Sailor Senshi and blackmails Sailor Moon into bringing the Silver Crystal in exchange for her friends. Sailor Moon comes to rescue them, and Rubeus takes her and Chibiusa (who had followed Sailor Moon in secret) aboard his spaceship. Onboard, a battle ensues for the custody of the Sailor Senshi. Chibiusa eventually finds and destroys the crystal that controls his spaceship, causing it to go haywire and catch fire. After Sailor Moon attacks Rubeus, the Sailor Senshi are freed, and they, Chibiusa, and Sailor Moon teleport away, leaving Rubeus onboard his burning ship. Rubeus is then confronted by Esmeraude, and begs her to take him back to the future. 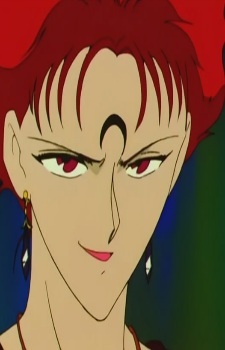 Esmeraude refuses, and leaves Rubeus in the unstable spaceship, saying he's failed too many times to be of any more use; in the end, his obsession with killing Chibiusa is his downfall. The spaceship finally explodes, and Rubeus dies. In the manga, he kidnaps Sailor Mars, Sailor Mercury, and Sailor Jupiter but fails to capture Sailor Venus. He is extremely loyal to Prince Demand, appearing with him to taunt the captured Sailor Moon. He realizes that there is more to Wiseman than what appears and he is killed by Wiseman when he confronts him.